IMGN Technologies turns pen and paper digital with their cNotes App, available for Android and soon iOS. Once completely reliant on pen and paper, medical practitioners now have a paperless alternative. 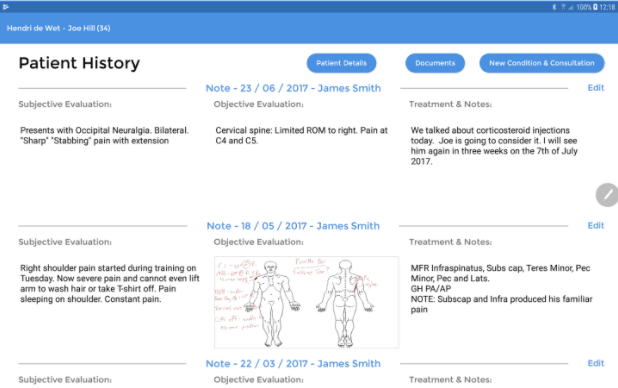 cNotes is a digital app designed to enhance the way medical practitioners take clinical notes and providing more efficient trackability of treatment. It is a cross-platform app, designed for tablets, with or without built-in stylus support, with the capacity to annotate, draw, type, write and sign PDF documents. IMGN is elevating the convenience of working with pen and paper to a digital tool which is accessible anywhere, at any time. This tool is helping medical practitioners to make the change to paperless offices, saving them time and money. IMGN uses Foxit PDF SDK to develop the functionality behind their PDF technology. This includes the intelligence to write digital notes through stylus, typing or drawing on a document which will then instantly sync to all devices used within an account. As well as having the advantage of annotating PDF documents like charts, drawings and treatment notes, cNotes provides the capability to create interactive PDF consent and billing forms that can be digitally signed by clients. This allows clients to take much of the paper stages out of their processes. IMGN’s innovation grants clients the ability to send a copy of these forms, once signed, to the client as proof, meaning that they can genuinely become paperless using this app. Foxit MobilePDF SDK supports the customization of UI elements through APIs, which makes it easy for customers to modify the UI elements of the built-in UI framework. This has allowed IMGN to create PDF documents and forms that are seamlessly integrated into their app, making the user experience throughout smooth and consistent. This enables IMGN clients the freedom to customize their documents and forms, as well as IMGN to choose how to limit client features within the app. Get in touch with us below to find out more about IMGN Technologies’ success.